What are some of the most popular places to visit in Illinois? What are the popular places to visit in Chicago? What is Illinois known for? Illinois River Map shows various natural streams of the state. The prominent rivers of Illinois include, Ohio, Mississippi, Wabash and Illinois. The Illinois river of the state is a prime tributary of the Mississippi river. Having a 68 miles long stream Illinois river is considered as an apt perennial resource. Illinois River Network map shows that flowing from northeast to southwest, Illinois river intersects the central region of the state. Tourism options like fishing and boating are also available in the river of Illinois. Ohio and Wabash, both of which are known to have immense perennial importance to the state of Illinois, make the southern and southeastern boundary of the state. Topographic llinois Map shows that the Mississippi river passes through the western border of Illinois. The river map of Illinois, apart from pointing out the main waterways, also marks the cities and towns that are located on the banks of such rivers. Rend and Michigan lake of Illinois can also be found in the Illinois river map. Illinois rivers on a map are shown covering a total of 14, 500 km, and the 2000 rivers and streams of Illinois, thus play a major role in the development of irrigation systems of the state. 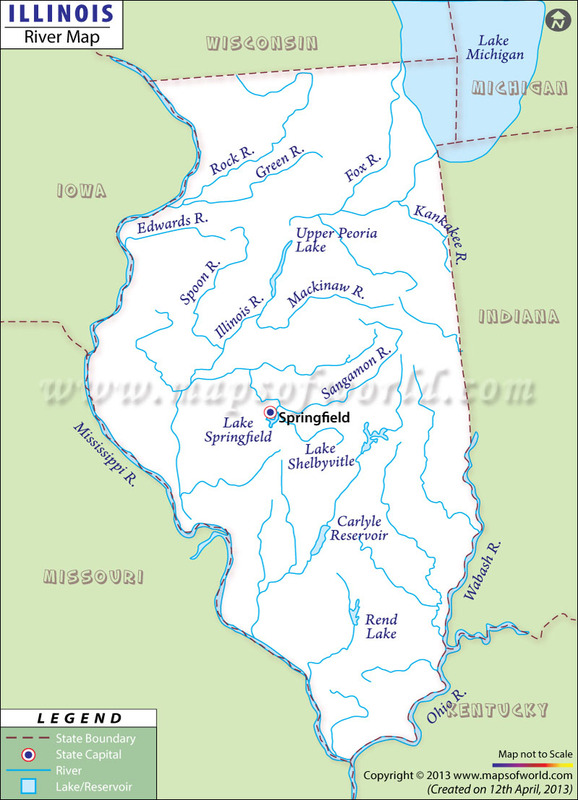 The Illinois state map highlights the major rivers of the place with accurate positioning.